Posted under Library, Service on Thursday, August 7th, 2008 at 2:02 pm, by Brian Herzog. Post and comments available via the RSS 2.0 feed. Both comments and pings are currently closed. I saw this posted over at Tame the Web and commented (more testily and angrily) there. What I’ll say here is that don’t assume that the categories “children” and “disabled” do not overlap. Were I a friend, family member, or parent of a disabled child and I saw this sign, I’d turn around and never come back to your library. I know I use those buttons when trying to get through doors while pushing a stroller (and I’m insanely grateful for them when they exist). I had no idea they were battery operated, but I’ll still use them. I do like the upper sign, though, because it frames the issue in a positive way, asking parents for their help with a problem, rather than simply saying “no.” I think it’s the lower sign that’s problematic. I agree that the signs are more of a band-aid on the problem. As a Circulation Dept Librarian, I have seen tiny kids hit those buttons & let themselves out the front doors – right into the parking lot traffic. If I had a dime for every little kid I’ve stopped from leaving the building without a parent – I could retire. We’ve also had issues with junior high kids jumping up in the air & doing really cool side kicks into the handicapped button. My feeling is that most signs get ignored & you can’t “retrain” the public to act the way that you want them to. What are the alternatives to posting signs ? Scowlding your patrons ? Having Security “watch” those rogue button pushers ? Or do we just sit back & roll our eyes at our co-workers every time it happens ? Librarians have a reputation for being fussbudgets & these signs back up the very stereotype that we are trying to break away from. On a personal note – My kids (age 7 & 9) are not allowed to push the handicapped buttons, not since our stroller days. 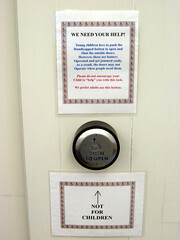 I have to agree with Brian, that the issue is not really the children, but the design of the button. I think you’ve got to take the signs down, because all the arrow is doing is making a visual beeline for children to that button. It might as well say PUSH ME! I also think that this issue is a little like the no cell phones in the library or the no food in the library issues — policies or suggestions that get made based on your worst-case scenario. Chances are, the patrons fooling with your button, regardless of their age, aren’t following the Rules of Conduct for your library, and you can ask them to remember to “respect the space.” And maybe it will make you feel better. Keep in mind, I was just submitting this as one example of what one library is doing – not that I thought it was the irreproachable gold standard. I do like megan’s point, and I do think this particular sign needs to be revisited. I’m going to bring the comments here up at our next department head meeting, to try and get a more inclusive and less tempting solution in place. We’ll see.